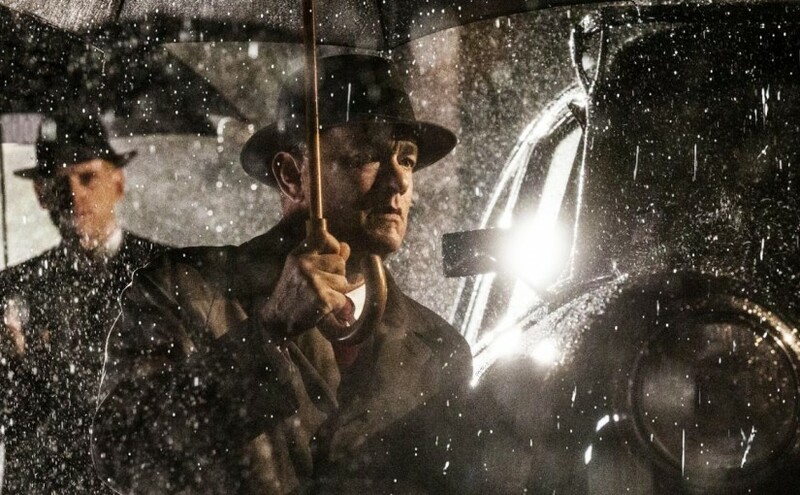 Any film would be proud to claim the singular involvement of Steven Spielberg, Tom Hanks or Mark Rylance. To be able to boast all three in one venture stands Bridge Of Spies on remarkably firm foundations. The overriding emotion when greeted with this movie’s clientele is of knowing we are in good hands. Arguably, the very best. Spielberg’s association with Hanks stretches back to Saving Private Ryan in ’98. They’ve collaborated since on various big screen outings, and also as co-producers of the HBO series Band Of Brothers (2001) and The Pacific (2010). Those acclaimed TV projects dramatised the moving and harrowing experiences of surviving World War 2 veterans. This latest joint venture shifts focus forward in time to the subtler, darker, more insidious tones of the Cold War, based on true experiences of attorney Jim Donovan (Hanks) in late fifties New York. That the pair has tempted Mark Rylance to the fold is noteworthy. One of the most highly renowned actors working today, his is a reputation for often resisting grandiose Hollywood fare such as this in favour of smaller scale theatre work. Rylance is Rudolf Abel, alleged Russian spy, trailed and seized by the FBI in the film’s pacy opening gambit. Hanks is the attorney tasked with defending him. Such a high profile case will doubtless attract the world’s media. And a figure as hated as a captured secret agent could easily face a biased hearing. So, for the credibility of U.S. justice itself, it’s crucial Abel gets a fair trial. Donovan’s supreme reputation sees him specifically chosen for the role. And thus, Rylance and Hanks are thrown together in a series of fantastically engaging two-handers early on. The former’s stagecraft is a masterclass in subtlety; relaxed, laconic, even soporific. Donovan notes Abel’s extraordinary composure considering the accusations levelled at him. Hanks could have passed similar comment on his co-star’s differing approach to acting. The two are wonderfully contrasting and complementary. Hanks’ trademark blend of Hollywood stardom with everyman persona radiates effortlessly from the screen, while Rylance’s portrayal is restrained, diffident, covert. Spielberg’s touch is similarly understated. Felt rather than overtly showcased. Apart from one pivotal and breathtaking action sequence, the direction is sturdy, statuesque, and classy. Shots feel as attentively crafted as the ornate woodcarvings that decorate the period legal offices and courtrooms we move between. This gentle thriller feels perfectly attuned to the Sunday afternoon slot. Thoroughly gripping, but holding the audience in the most comforting of grips. Though there is one nod to the convention, this is not a breathlessly paced noir, with threatening shadows chasing their quarry down dark alleyways; this is a script-led drama of political negotiation. It cannot be considered among Spielberg’s best; an interior-set dialogue piece cannot fairly be compared with the peerless thrills of his family-oriented fantasy adventures. And while it’s possibly a touch long, you really don’t mind when it’s a pleasure just to be in such easy, professional company as Hanks.